Argentine contemporary artist Ignacio Alperin Bruvera has been in the news lately. An already established artist with international exhibitions on his resume, Alperin has explored the pictorial side of music with his long standing “Visual Jazz” series. A lover of art and music since an early age, particularly jazz and all its variations, he has always endeavored to put both artistic forms of expression together, looking to synthesize them into new creations. The result is a well recognized style, art that has a hidden and well rehearsed structure within a sea of improvisational skills, rhythms, colors and cadences. 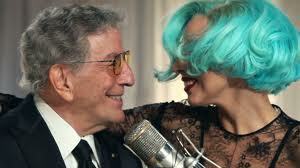 His art is very personal, baroque at times, simplified and beautifully succinct at others. His works takes on many forms, and yet his hand and his vision is always recognizable. Alperin was born in Argentina, grew up in Australia, and circumstantially lived and traveled th roughout Europe, America and South East Asia.He professes an early love for masters like Kandinsky, Picasso, Van Koenig, Rauschenberg, as well as admiring the clinical genius of Leonardo. 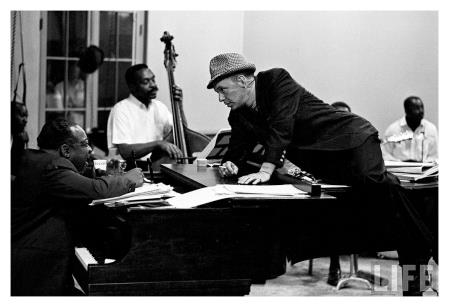 His musical tastes were centered around Jazz, blues and classical, but his heart was mostly with the great bebop and hard bop masters like Evans, Coltrane, Monk, Davis, Pepper, Bird, and the golden era of American voices like Ella, Sinatra, Bennett, Dinah Washington, and Nina Simone. In recent times he has slowly entered into the realm of object design and sculpture. He recently introduced his latest piece at Art Deco, an Exhibition of intervened objects by well known Argentine artists, which took place at the Recoleta district in Buenos Aires in late April. His design is exquisitely simple. 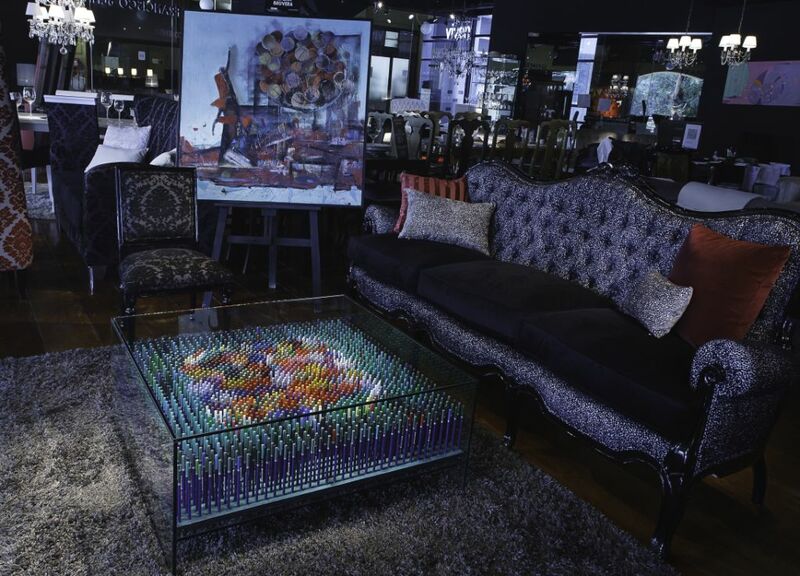 An all crystal coffee table within which, just like a transparent jewel box, he has placed a sculptural piece made up of more than 1800 Faber-Castell Goldfaber artistic pencils standing perpendicularly and making up a colorful and airy version of the painting that lurches beneath. The result is a masterfully creative piece, almost constructivist, full of tridimensionalities, nuances, shadows, and optical illusions. There is substance and lightness, color and darkness, and above all a joyful sensation of being in front of something that is creative and new, yet familiar. It strikes me that every person, whether young or old, who has stood in front of the finished table ends up drawing out a big and happy smile. The color pencils create a link to something very familiar, something warm within each one of us, and initiate the communication with the viewer immediately”. 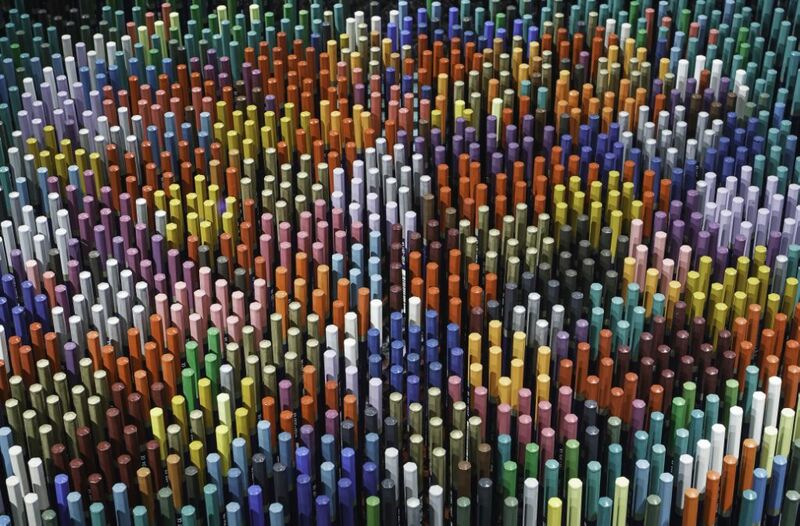 “A gentleman told me at the exhibit that whenever he opened a new box of color pencils with his grandchild, the smells and the sounds of those colorful wooden sticks would just make him happy and warm all over. Something like that is what I was looking for with this intervention and those who view it. I hope I managed to achieve it”. It’s truly a great and useful piece of info. I am satisfied that you simply shared this helpful info with us. Please stay us informed like this. Thanks for sharing.